On January 28, 2012, a cherry picker showed up in front of the Rockwall County Veterans Memorial, cutting 5 feet off the top of the United States flagpole, reducing it to the same height as the Texas and POW flags. The flags were then rearranged, with the United States flag moved to the right. This was done without the knowledge or approval of the County Commissioners court. I am a native Texan, and a proud one at that. I have lived in other states and countries, but always come back to Texas. It is, and always will be, my home. If you are a native Texan, you know exactly what I am talking about. We’re bigger & better than any other state. In fact, Texas was a country before it became part of the United States! Although Texans are proud of our state, we are also citizens of the United States of America. Texans are extremely patriotic; and support our troops and our veterans. 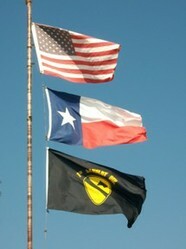 We fly United States and Texas flags at our homes, places of business and entertainment facilities. I personally fly an American flag, Texas flag, and military flags 365 days a year. I do this in support of my country, my state, and my husband, who was a Vietnam veteran. No, but I got to Texas as quick as I could! Members of the American Legion Post 117 from Rockwall County, Texas are one such group of patriotic Texans. This group of veterans have worked for years to bring a veterans memorial to their area. Several attempts were made, including a plaque on the Rockwall County courthouse building. In 2005, several members of the Post decided a memorial was needed to honor the veterans from Rockwall county. A new courthouse was being built in the town of Rockwall, and the Rockwall County Veterans Memorial could be located next to it. The Veterans Memorial Park was to be a place for public gatherings; an area to contemplate and remember veterans; and a site for special events. The memorial was to represent the loss of the thousands of Rockwall County veterans who paid the ultimate sacrifice in the name of freedom. It was also to be one of the only veteran’s memorials with 3 battlefield crosses: WWI, WWII and a current battlefield cross. A proposal to build the Veterans Memorial Park was presented to the Rockwall County Commissioners Court, and it was accepted. A committee was formed - The Design Jury and the Dedication Committee - to conduct extensive research into every single detail regarding the placement, design and execution of the plans for the Rockwall County Veterans Memorial. Their mission was to precisely follow official and established protocol, and the statutes of the United States and Texas. A design was created and presented to the Rockwall County Commissioners Court. In the plan, the Memorial includes the flying of the United States, Texas, and Pow/MIA flags. The United States flag was to be located in the center of the other two, and slightly higher. The plan was voted on by the County Commissioners, and unanimously accepted. Funds were raised for the building of the Memorial, including money from the veterans of American Legion Post 117. On Veterans Day 2011, Rockwall County Veterans Memorial was dedicated and opened to the public. Is height or vandalism the issue? It came as quite a surprise to the community when just two months later, the United States flagpole was resized. There had been no court order, nor any authorization. It just happened. During a hearing, a Commissioner came forward, admitting he was the one who authorized the action. He stated he was only following the Texas law that mandates all flags be flown at the same height. In addition, this same man, Commissioner Wimpee, presented Rockwall County with a bill for $760 to cover the cost of trimming the pole's height. "The flag of the United States of America should be at the center and at the highest point of the group when a number of flags of States or localities or pennants of societies are grouped and displayed from staffs"
"If the state flag and the flag of the United States are displayed on flagpoles/flagstaffs at the same location: (1) the flags should be displayed on flagpoles/flagstaffs of the same height." Does the United States Flag Code Supersede the Texas Flag Code? What exactly is the issue behind the flagpole controversy? Rockwall County Veterans are insulted and angered by the action of Commissioner Wimpee, calling him a vandal. They demand that he return the United States flag to it’s original height. Rockwall County Judge Jerry Hogan states: “This is not an issue about flag placement. This is an issue about an individual without any authority coming over here and destroying one of the flagpoles." Rockwall County has called in the Texas Rangers to see if Commissioner Wimpee has committed a crime. Until the investigation is complete, we only have our opinions on how this issue should be resolved. What is patriotism? Is vision part of being patriotic? Who is patriotic? What do you think? Is the issue the height of the flags, or is it an act of vandalism? If the two flags are at the same height, then indeed both laws are satisfied. The United States flag is at the highest, which may tie in height another flag. The wording does not state higher, as high as does just as well. The Commissioner obeyed the law. He's got a leg get to stand on and it can't be sawed off. You'd have to stretch it to call his obedience to the letter of the law an act of vandalism. For peace sake, the county should pay the bill on go on with their lives. Do Commissioners get elected or appointed? I am not American and certainly not an expert for flags, but why this can't be solved like in sport? You have a law saying one has to be first and you have a law saying all have to be the same. Can't you have both first? Both on same (highest) heights? By the way, Texas have great sport teams too. Thumbs up for San Antonio Spurs! The Republic of Texas joined the USA and was not annexed as other states. The State of Texas retains the privelege of flying its flag on the same level as USA flag by treaty agreement. To ask if USA law supercedes Texas law in this matter is to ignore a historical factual right.